Antique ebony handled silver flatware has an elegant look with the striking contrast of rich dark wood and exquisite silver metal. In Greek the word ebony means fruit of the Gods and this beautiful exotic wood is surely worthy of its name. The ebony used on antique knife handles is known as Gaboon ebony, a very dense hardwood. This ebony is generally pure black but may occasionally have seams of a rich chocolate brown. Gaboon is also known as African ebony, Gabon, Nigerian ebony and Cameroon. Flatware handles made of beautiful black ebony, lustrous mother of pearl and exquisite ivory came into vogue in the late 1700s during the Georgian Period in England. Tableware and service pieces with these lovely handles continued to be a popular style of manufacturers throughout the Victorian, Art Nouveau and Art Deco years. In France as the Rococo style drew to a close in the late 1700s, the simplistic clean lines of the Neoclassic and Edwardian styles were a perfect design for flatware with contrasting handles. The combination of exotic ebony and sterling silver the manufacturers began producing had the look of elegance and beauty. When these exquisite flatware pieces were first introduced, they were very popular with the upper classes of society and nobility in England and throughout Europe. 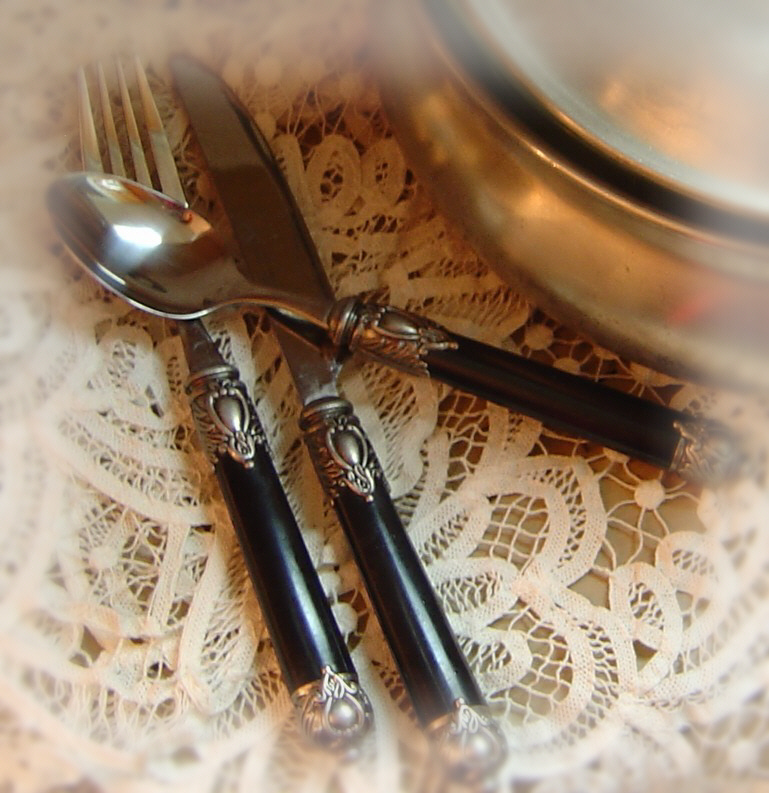 There are many exquisite examples antique flatware with handles made of ebony. Many of the gorgeous pieces have tines, bowls and blades of sterling silver while others have tines or bowls of ivory. Often the ebony handles have ferrules and caps of decorative sterling silver. 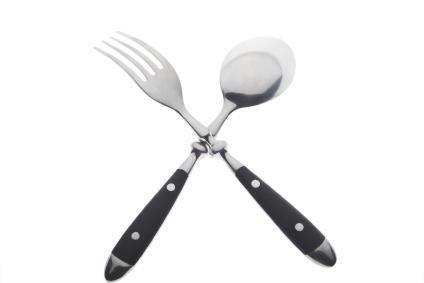 The following are examples of this elegant antique flatware. A beautiful example of a punch ladle from the late 1700s is provided by The Silver Collection Dictionary. Due to the scarcity of silver and the weight of the metal, punch ladle handles were made from exotic woods such as ebony, whalebone or ivory. Notes from a Cottage Industry ebony handled flatware. The following items were recently seen on eBay. An exquisite 208 piece set of French flatware made by Granvigne Silversmith in Paris dating from 1870-1880. This beautiful set is sterling silver with ebony handles on the knives and serving pieces. A 19th century French dinner knife set with collars and ferrules of sterling silver, ebony handles and stainless steel knife blades. French ebony and sterling silver dessert service with six dessert forks, six dessert knives and one service shovel. The knives and forks have the silversmith mark of Jean Mercadier of Paris in 1890 and the service shovel has the silversmith mark of Pierre Le Roux of Paris in 1887. The elegant look and design of antique ebony handled silver flatware makes these desirable antiques highly prized treasures of collectors throughout the world.